“When I got home, everything was on the floor, shattered. 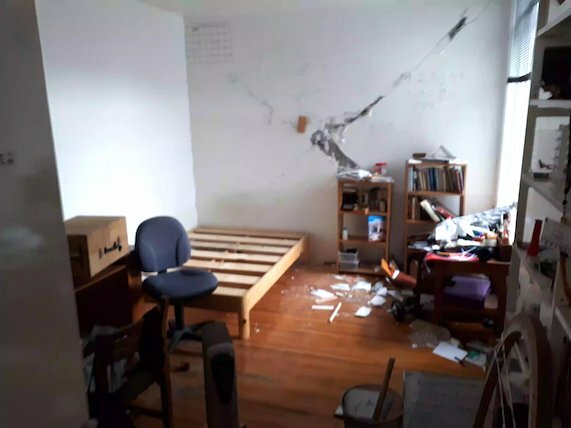 I grabbed all my valuable things and left before anything could happen,” says Ariel Goldin, a victim of the 7.1 magnitude earthquake that hit the Mexican capital and many of its surrounding states a year ago today. Hours before the tremors leveled some of the massive housing complexes in the city, the entire country observed a minute of silence for the over ten thousand victims that died on the same day 32 years ago by an 8.1 magnitude earthquake. Last year's earthquake took the lives of 471 people. In many cases, the poor infrastructure was due to corruption and poor oversight in the construction sector, often aided by bribes to government officials. 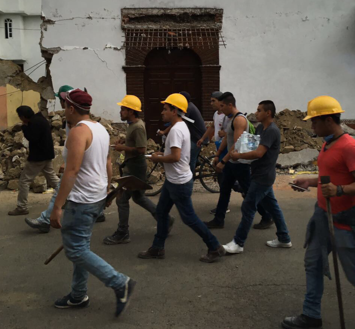 The misallocation of funds and improper building techniques using cheap materials is a significant problem in Mexico that is currently being investigated by several NGOs. One of the NGOs working on corruption is Mexicanos Contra la Corrupción y la Impunidad, or Mexicans against Corruption and Impunity, (MCCI) who published an investigation last week that took a year to compile. The investigation reveals the horrible conditions the buildings were in before the earthquake due to the fraudulent conduct of some in the construction and government sectors. Ariel is a victim of the corruption exposed by the earthquake. After finding out that he could never go back home because the building he lived in was in danger of collapsing and both the government and the construction firms were not doing their part, Ariel Goldin and his neighbors decided to take matters into their own hands and look for answers. When MCCI addressed the damage to the building where Mr. Goldin used to live, they called in an engineer who claimed the structure was built in 1949, and that the first two floors were not built with the same materials as the rest. Many of these materials were used incorrectly and altered the supporting structures of the building. The engineer viewed this as a case where the architect and engineer were never present during construction, which would help explain the wrong design of and improper use of materials that caused it to collapse in the first place. Ariel is still not able to go back to the home he grew up in because the government has not supplied the sufficient economic help it promised to provide in order to rebuild it. He is one of many stuck without a lifeline a year after the disaster. 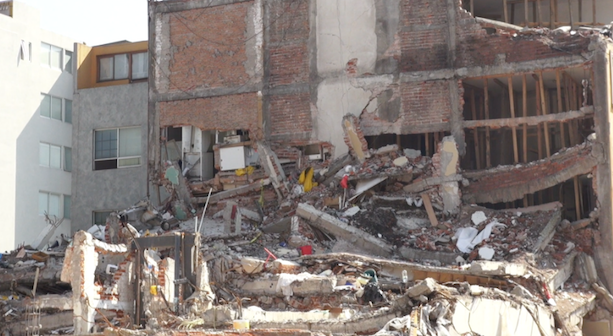 For many years, citizens of Mexico City complained about their buildings, denounced the unlawful use of land space, the construction projects with no permits, and the structures that were already damaged by the 1985 earthquake. According to Thelma Gómez, the lead investigator at the NGO MCCI, many of these buildings were covered up, rebuilt, and resold as new condos. This web of mismanagement has caused the deaths of many, while others lost everything because the damage to the buildings was severe. It is uncertain how many of the victims will receive remunerations. Mexico's construction sector has many layers, positions, and people of power involved, so partitioning responsibility is a complex task. The people responsible for the negligence range from government officials to contractors from private companies. To assess culpability the corruption practices need to be addressed on a case by case basis. 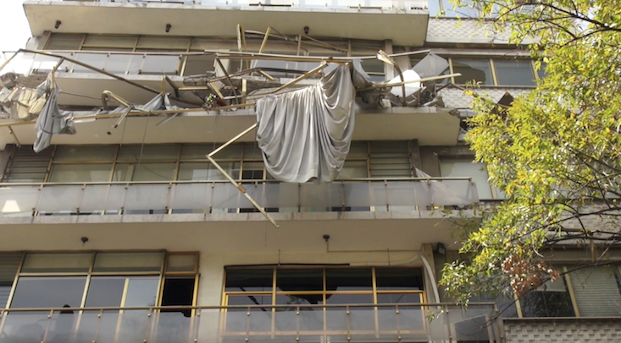 Residencial San José, a building erected in 2016 in the Portales neighborhood in Mexico City, collapsed during the earthquake. This led to the death of two woman who were in the building at the time: Matilde Téllez and Karla Santos. The construction company behind the project is called Canada Building Systems México. According to the MCCI investigation of this building led by Thelma Gómez, for the construction company to be able to break ground they needed to do a full study of the soil where the building was going to be built. Geotécnica OST -- the company Canada Building Systems hired to do the study -- did this in 2014. The company made several recommendations to start the project "considering that we want to have a safe but economic construction process". By doing this, the contractors saved between 10 and 12 percent of the amount designated for the project. By significantly reducing expenditures and cutting structural corners the company left the foundations of the building, and the lives of the owners of the apartments that were going to be sold, to chance. In 2016, before the building was finished, Canada Building Systems Mexico asked The Quality Control and Geotechnics company for an investigation of the building’s general areas and materials. Out of 50 points possible for the test, 27 were marked as “not acceptable”. The position of Director Responsable de Obra (DRO), the person responsible for overseeing the building during construction and ensuring proper practices and techniques are used, was created after the terrifying events of the 1985 earthquake. The position is responsible for checking every aspect of the building process to make sure it is following the Construction Regulations for Mexico City. The issue is that the DROs are hired by the same construction company that is developing the building. This is perceived as a conflict of interest since it is their job to evaluate the job site and give the go-ahead to the constructing firms at different points in the building process. The DROs failed to do their jobs in many cases for the buildings across Mexico City, yet many of them still have their license to work. They receive licensing through the Secretariat of Urban Development and Housing (SUDH). The SUDH did not reply to a request for comment from the Plume when asked about the license used by the to DROs responsible for checking several of the affected buildings. According to MCCI, Juan Duay was the DRO tasked to approve the construction on the Residencial San Jose Building in 2016. He is accused of signing and authorizing a weaker foundation for the building because it of the lower cost. Juan Duay declined to comment. DROs are also supposed to review and sign the documents presented to the authorities that register the construction manifest. According to MCCI, Mr. Duay did not adequately examine the blueprints and other documents involved in the construction of Residencial San Jose. If he had done so, he would have realized that the documents he signed were under the 1997 Construction Regulations, which were not valid when the building started construction. Because of this, the building located at the Portales neighborhood did not have the necessary documents to follow regulations. The poor building practices, combined with the magnitude of the earthquake, is the reason for the collapse of the building. Improper documentation and construction reveal the abuse of power in the construction sector and the negligence of the government and construction companies involved. The company Canada Building Systems México has not answered the allegations against them and has seemingly vanished. The owners have not been held responsible. Mexico is still rebuilding one year after this terrible tragedy. “There is a combination of corruption of negligence and impunity makes the buildings that we live in vulnerable. And not only where we live, but where we study and work,” says Thelma Gómez, a reporter with MCCI.